November 28th, 2012 | Pendragon Acres U.S. K-9, Inc.
Tucked away in a secluded part of northern Hernando County is a little known secret. Surrounded by 10 foot tall fencing and fronted by massive iron gates, a canine wonderland exists where top pedigree German Shepherds are bred and trained. But these canines, with DNA tested bloodlines originating back to Germany, are more than the makings of future cherished family pets. They are changing the quality of lives. Michael Giannetti, owner of Pendragon Acres U.S. K-9, sees a much broader scope than simply breeding for quality his world famous shepherds. Many of them reside in homes of celebrities and influential people who wanted to protect their families and their property. “I want to help people have a better quality of life,” he added. These shepherds are bred for protection and as assistant service canines for people, including children, with disabilities. 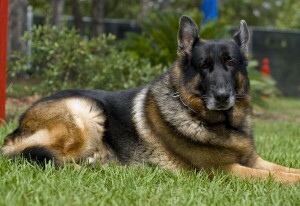 Larger in size than other German shepherds, Pendragon canines are the epitome of health. Pendragon shepherds aren’t cheap. Pups begin at $2000 each, require an application for adoption, and afford a future of benefits including limited or full breeding contracts with Pendragon. Clients become part of the Pendragon family and build lifelong relationships. Pendragon Acres U.S. K-9 is well deserving of praise. Through a history of prime canines, the Giannetti’s have perfected the line and how they train not only shepherds they place but others that are brought to the facility. Chris Dyals, a decorated war veteran who served in Iraq, brought his German shepherd to Pendragon for training. A resident of Ocala, Dyals wanted a canine to protect his family and to perhaps one day help other wounded veterans. Dyals’ 9 month old pup, Barrett, has been training with Pendragon for a few weeks. Dyals is already noticing improvements in Barrett as the canine learns through a process that cultivates the foundation with positive reinforcement. “It builds the relationship,” Dyals said. Although he didn’t purchase Barrett from Pendragon Acres, Dyals was immediately welcomed into the family. “I’m getting a lot more than training,” he said. Clients that purchase a pup often return for additional canines or to board their pup in the luxurious kennels, reserved for clients only. “They don’t trust anyone else to take care of their shepherds when they’re gone,” Michael said with a firm nod of the head. That is because anyone who experiences the Pendragon compound learns immediately that this is no typical facility. The canines command quality because they are produced in a system that leaves nothing to chance. The Giannettis live and breathe their business. Michael is a well established promoter and facilitator. Ruth Ann runs the daily activities, treating the canines like her children. No cost is spared these pups, which are given the best in quality veterinary care, feeding products and training. In fact, Pendragon has perfected training methods that build confidence in the canines, bonding their loyalty for life. Pendragon Acres’ newest endeavors include placing pups with physically challenged families. “We work with children with Autism, Cerebral Palsy, Down syndrome,” Giannetti said. In fact, Pendragon Acres recently placed a 12 week old pup with a local family raising 5 children, 3 with cerebral palsy. Pendragon donated the puppy and is facilitating fundraising to raise the funds to train him as a service canine. The cost of the training runs about $35,000 for a special service canine and will be covered through high profiled media events, like Mixed Martial Arts Challenges, sponsorship, drawings, and ticket sales. Pendragon recently signed a two-year commitment along with Dion De Lauder, the Producer and CEO of the Florida Combat Network, CBS Radio 98.7 The Fan, and Channel 10/10 Action Sports to sponsor and market the Mixed Martial Arts Showcases both nationally and internationally. Those who donate to help the cause can follow the progress of the canine since Pendragon spotlights the family through an assortment of media coverage. Pendragon Acres U.S. K-9 is also associated with Cigar Dave, the creator and host of The Cigar Dave Show, which is nationally syndicated and devoted entirely to the Cigar Lifestyle. “Cigar Dave has a Pendragon canine,” Michael Giannetti said. In fact, Pendragon will have a special booth at the Tampa Cigar Festival on December 1 at Cotanchobee Fort Brook Park in downtown Tampa. Several of the shepherds will be onsite during the festival. 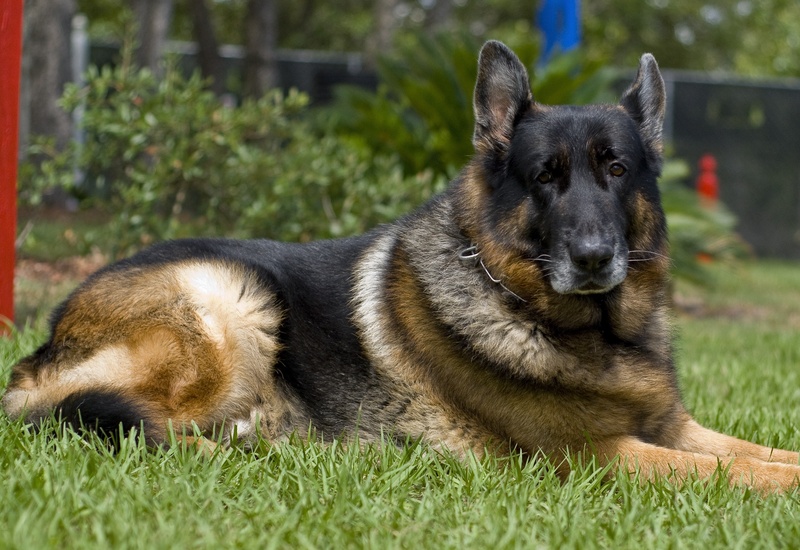 Michael Giannetti’s family has been raising German shepherds for more than 35 years. “I’ve had shepherds my entire life,” Giannetti said. Michael and Ruthann Giannetti launched Pendragon Acres 15 years ago to carry on the legacy his parents started. They built the state-of-the-art training facilities, luxury kennels, even a maternity ward equipped with everything necessary to guide nature’s progress. “We know exactly when the pups will arrive,” Michael said. He expects three litters will drop by Christmas. Michael is also working to place shepherds in the homes of wounded war veterans. Special discounts for purchasing the pups and training as assistant service canines are available.